So in honor of the weather, here are a lady and gentleman mallard by Nicole, the photographer I met in the park this week. I felt a bit guilty for dissing mallards; they may be ubiquitous, but they are lovely. EXTRA: PARK MYSTERY FILM SOLVED! A delightful tale just gets better: Todd Bieber, the young New Yorker who found and developed a roll of film of some frolicsome tourists in Prospect Park, did succeed in tracking them down, and visited them in Paris. Check it out here. Time to unpack a Guest Park: London's s Hyde Park, where the family and I sought green space just one month ago. What I recalled (from 30 years ago!) as an emerald swath was toasted brown, thanks to a brutally warm and dry English spring. We staggered in through Marble Arch, shell-shocked by shopping in nearby Primark, a sort of cross between Wal-Mart, Century 21, and an all-female rugby match. No cool grass to flop onto as the sun set, only stubble—and pricey rental deck chairs. And no benches, to make you rent the deck chairs. Nor was anyone ranting on a soapbox at Speaker's Corner; has the Internet rendered that obsolete? 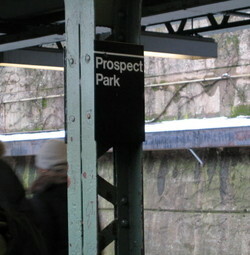 Hyde Park, although smaller than its Brooklyn cousin Prospect Park, has much in common. We have the Camperdown elm; their "upside-down tree" is this weeping beech. We both host fantastic concerts (theirs have included Queen—Freddy, not Elizabeth—and the Proms), and we both rent paddle boats. Their lake is called the Serpentine. And both parks are playgrounds for folks from all over the world. Hyde Park, at least on this day, was full of Muslim ladies cloaked in black from head to toe, some with Western casual style but many with only their eyes showing. This I found disconcerting. No, to be honest, it provoked within me an ugly little wave of wrath, and not only because of New York's and London's shared history of terrorism and the fear of it. It pushed my feminist buttons because their men were all dressed in comfortable shorts and T-shirts. And it pushed my Anglophile buttons because I wanted England to be the same after 3 decades. Brooklyn is supposed to be the "gorgeous mosaic"; immigration is our country's reason for being (as I like to lecture my fellow conservatives). But I wanted my London to be frozen in an old movie, and my England to be a protected well tapping straight into our ancient shared cultural water-table. In truth, the country is staggering under the legacy of its open-door policy on many fronts, but still, it was not one of my proudest moments. We were too tired to check out Kensington Gardens or even to search for the Princess Diana memorial. But on the way to the Tube at twilight, en route to Rotton Row, we passed this lush glade. A heron fished in the stream, and this mystery bird showed off a beak as red as a Guard's uniform. Just here, things felt peaceful and, yes, unchanged. No, this is not Prospect Park Lake! It is Rockland Lake State Park, where we cheated on Brooklyn for a Sunday drive yesterday. This lake, where we picnicked, is bigger than ours; it used to be a hub for the ice industry, which put me in mind of the fictitious "Lake of the Coheeries" in Mark Helprin's Winter's Tale. But today was a summer's tale. I wanted to revisit the scenic ride up Route 9W that I'd taken last April on my bike—this time without the frantic pressure of training with a cycling team. After lunch, thanks to this site, we nosed the car down steep little Landing Road on the perimeter of the park for a hike along the Hudson. This is a real treat; much of the Hudson's beautiful shoreline is inaccessible. The day was perfect, and almost the entire walk was in delicious cool shade. Lots of wildflowers (including noble stands of mulleins and dainty butter-and-eggs), and a spider web rendered totally inoperative by fluffy seedheads. Don't you hate it when that happens? The trail passes under towering brownstone cliffs, and passes a ruined stone hut that was probably built, like much of the park's infrastructure, by the W.P.A. From inside the hut, we tried some Edward Gorey action. Finally, the path opens out onto a coastal swath with huge views of the opposite shore to the East and the Tappan Zee to the south. (At left, the bridge is lost in mist on the horizon line.) We scrambled around on the muddy rocks; the water looked pretty clean. At right: This guy, an American Staffordshire terrier found roaming the streets of Jersey City a decade ago, didn't care; he just loved digging in the gravel. I think that's Ossining over there. We cooled off with a swim in the pool at Tallman Mountain State Park a few miles south (the same day ticket is good for both parks), and got coffee at Bunbury's Cafe in Nyack, site of a precious bathroom break on my training ride. I promised the family a fine selection of baked goods there, but at 6 p.m. there were just a few cookies left. Cyclists had eaten everything else. 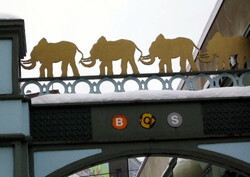 Fascinating discoveries on a slushy grey afternoon, and I didn't even make it past the subway station. "gorgeous mosaic" on the mezzanine. It's called "Brighton Clay Re-Leaf Nos. 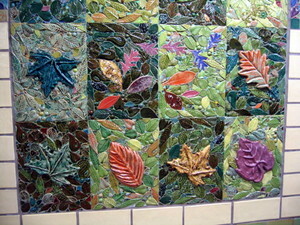 1-4, 1994" and was made by artist Susan Tunick; turns out the MTA has a nice web page for every piece of its subway art. Unfortunately, the rest of this 1905 station is less sparkly and inviting, despite ambitious attempts at renovation over the years; I would have photographed some radical peeling paint, but the knot of surly young persons congregating in front of it deterred me. 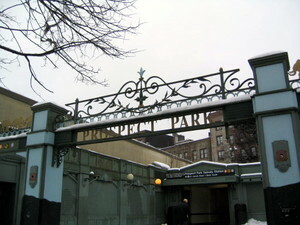 The turnstiles are in an above-ground station house whose entry plaza remains awkward and forbidding despite this lovely gateway with its inviting reminder of the nearby Prospect Park Zoo. 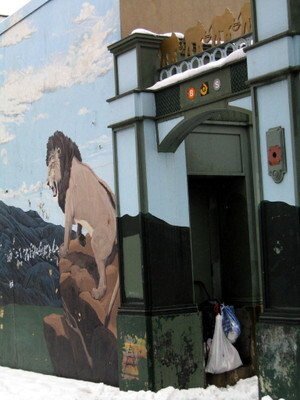 The entrance is flanked by a zoo-fantasy mural that must have radiated childish charm when first painted, but is now flaking and graffiti-scarred. Even the decals for the B and Q lines are peeling off, and some enterprising can scavenger has stowed his or her cart in the cul-de-sac. This karma of failed gateway grandeur extends like a mild curse to the surrounding area at the park's southeastern border. The Bond Bread clocktower, now a ruin, presides over a beer distributor and "Phat Albert Warehouse." Around the corner, in what should be a prime location opposite the park, is a cheesy furniture outlet; nearby, Empire Boulevard presents a vista of fast-food outlets. And of course, just blocks away stand the dismal apartment houses that replaced the holy ground of vanished Ebbets Field. It is as if Flatbush Avenue, having marched proudly between the green flanks of Prospect Park and the Brooklyn Botanic Garden, sort of slumps into a gritty urban crouch as it enters Flatbush proper, before soldiering on southward to the sea. And of course, it was at this very stop that the most hideous accident in New York's subway history took place--the Malbone Street wreck. And that is a story for another time.